Dozens of Swedish neo-Nazis accost pro-Israel activists, assault two of them south of Stockholm. Neo-Nazis in Sweden assaulted two pro-Israel activists on Thursday outside a pavilion set up by the Israel-Sweden Friendship Association. 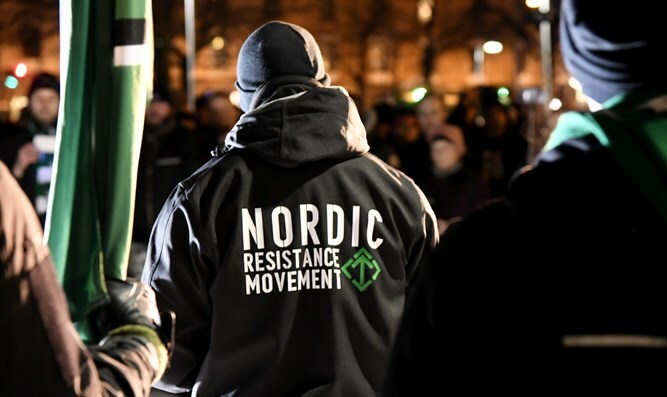 Dozens of members of the Nordic Resistance Movement gathered around the pavilion on the island of Gotland, south of Stockholm, for what they said was a “protest demonstration,” the Aftonbladet newspaper reported. One of the victims, Christina Toledano Asbrink, told the paper that the neo-Nazis tried to cover the pavilion’s Israeli flag with their banner. When she intervened, several men grabbed her and shook her violently before pushing her to the ground as other members of the Israel-Sweden Friendship Association began calling for police. Stefan Dozzi, the pro-Israel group’s secretary, was lightly injured in a scuffle that erupted outside the pavilion after Toledano Asbrink was thrown to the ground. She was hit in the head and treated for minor injuries. The association set up its pavilion in Almedalen this week as part of Almedalen Week, an annual forum that gathers Sweden’s political, business and media elite together on a small corner of Gotland. This year is the event’s 50th anniversary. “I’m so damn pissed and upset. But we will not be cowed into silence. We’re still here,” Toledano Asbrink said. Police have made no arrests, Aftonbladet reported, but have increased their presence and monitoring of neo-Nazis’ activities.